How do I make $20 daily with revenue hits? Home › Category: Online biz › How do I make $20 daily with revenue hits? Am a Nigerian blogger with a local blog that gets over 25k daily page views. I wish to monetize my blog with revenue hits but considering my stats, can I make $20 per day with my Nigerian audience of course I earn more with direct ads. I just want some extra cash flow? Yes you can make even more than $20 considering the volume of audience you have. 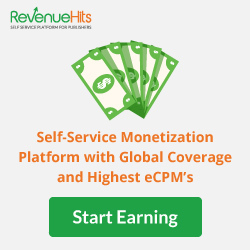 However, revenue hits is a CPA based network, they only pay per action taken by your user. So you should have it at the back of your mind that you will not get paid if your users just click on the ads. This is why your traffic may not matter. They pay let’s say when your users click on the ads and take some other actions such as App installation, making purchase or subscribing to the advertiser’s site. I used revenue hits when I started blogging but I was not able to make up to a dollar. My blog was relatively new with less than a 100 page views per day, I was naive and wanted to monetize from day one. I got frustrated when I couldn’t earn anything good and removed the ad codes from my blog. I never tried them afterward since I later got an approved AdSense account. I’ve seen a lot of music blogs do this and I’ve personally click on them thinking it’s the real download button. Sha, it’s because they didn’t have enough Nigerian advertisers then. I’ve read a lot of articles about them before they pay well. From my observation, you will make good money with revenue hits if your blog in in the entertainment or file sharing niche. Their ad units always look like a typical download button so if you have a music download site. You’re likely to earn good cash if you place the ad codes beside your main download button. How much does youtubers make daily? I personally make around $13 daily with 20k page views. Once you’re logged into Revenue Hits dashboard. Select the ad format that you like. Revenue hits Ad format includes Banners, Popunders, Slider, Shadow Box, Top Banner, 158*21 button and Footer ads. The revenue hits team recommend Shadow Box and so does Ankit of BTT for high conversion rates and great revenue. Once you select the ad type you want, Revenuehits normally asks for ad size and placement description. Add a nice description so that advertisers will understand the purpose behind creating a particular ad unit or where are you going to place it. You will get the ad code by clicking on the ‘’ button towards the right. One good thing is you can preview your ad unit before you implement it. With revenue hits, your revenue can fluctuate a lot. According to the information i got on BTT, Many bloggers based on their interaction on forums say that they make around $50-$60 per day with a traffic of around 10000 and the next day they may make nothing. 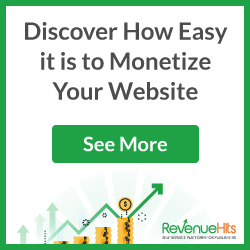 Some bloggers using Revenue hits make around $5-$10 per day from first day itself using Revenuehits with a very very less traffic. Revenuehits displays ads based on Geographic location. So if you’re in UK then you wont see ads based on US amazon. They pay on monthly basis via Paypal, Payoneer or Wire Transfer. The minimum payout for PayPal and payoneer is $25.